A brief background story: ‘Debutante’ did not do well in the place I first planted it, and I was afraid that I was losing it. I moved it to my “wayward plant hospital,” a place at the edge of the woods in back of my garden that became the home to plants that needed a second chance before the compost heap. ‘Debutante’ not only survived but has thrived in its new location. These colorful blossoms speak to the wisdom of giving plants (and people) a second chance. Please visit Cathy at Rambling in the Garden to see what she and others are sharing in their vases this week. 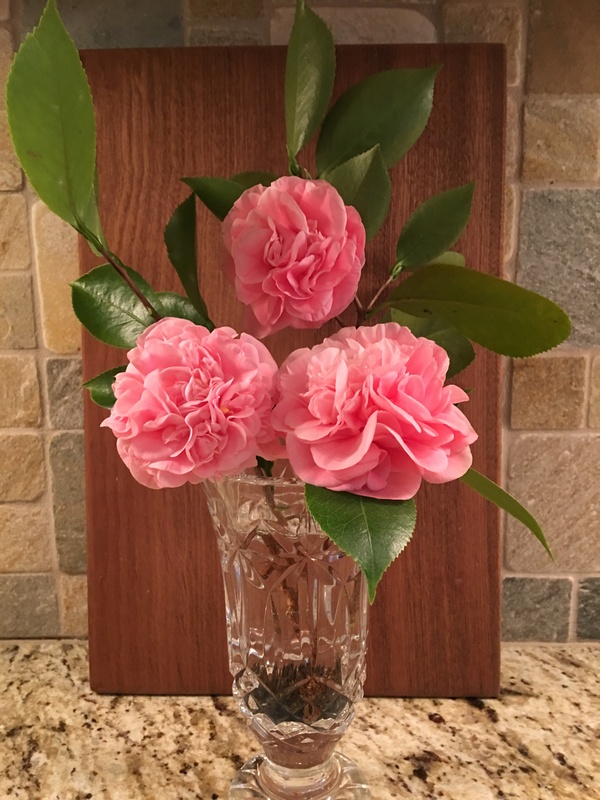 This entry was posted in Gardening, In a Vase on Monday and tagged Camellia, Camellia japonica 'Debutante', Rambling in the Garden. Bookmark the permalink. My Camelias have buds but it will be early 2017 before they pop open! These are lovely. Debutante is always an early bloomer for a japonica. A most welcome sight. Glad you managed to revive Debutante. What is different about the conditions in the new location? Not a lot of difference. Perhaps a bit more shade. Debutante is obviously very happy now, beautiful coral pink flowers. Sorry for the delay in responding. Thank you for your comment. You have things that grow well there that we can’t. Thanks you for your comment. Sorry for the delay…I don’t know where your reply hid itself. I love camellias. When I lived in England I had several in my small garden but then I moved to Canada and the climate was too severe for them. So thank you for giving me a camellia to look at! I think we all have had plants that we loved, but we can’t grow them in the spots to which we have moved.